Today I have a very important post to share with you and it's quite personal. I wanted to help raise awareness for the importance of Smear tests, also known as Cervical Screening. 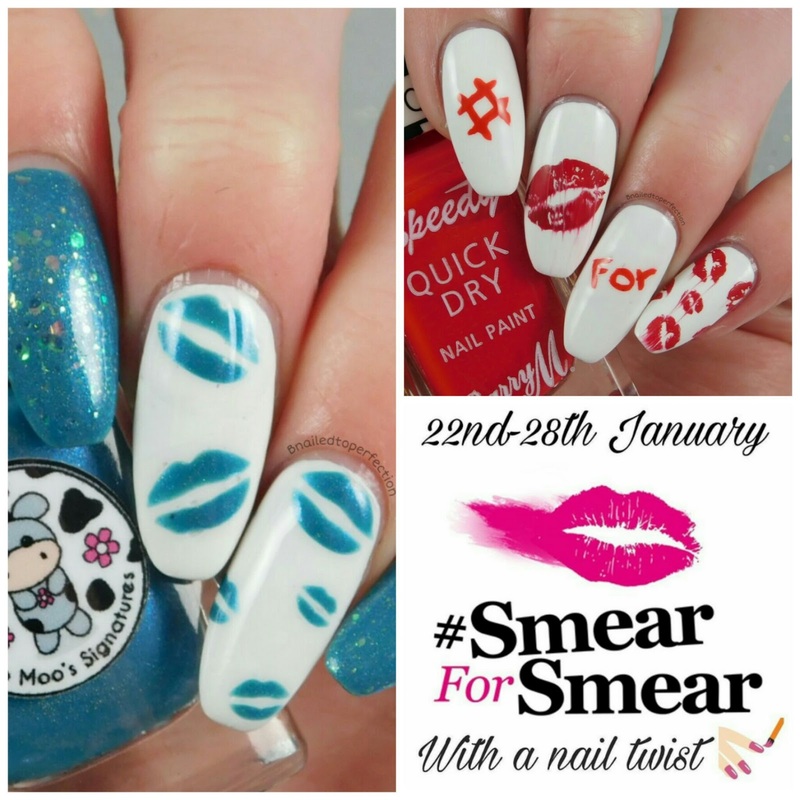 I became aware of Jo's Cervical Cancer Trust and found out that every January they run a campaign on Instagram called #smearforsmear. They call on women everywhere to apply lipstick, smear it and post a selfie to help spread the word that Smear tests are very important. I put my own twist on this and asked the nail community to join in and smear our art to help create more attention for the cause. My first nail art that I created was literally #smearforsmear. I free-handed the words and the #, and used two stamping plates for the images. Uber Chic Love and Marriage 03 and Kisses by Color Club. 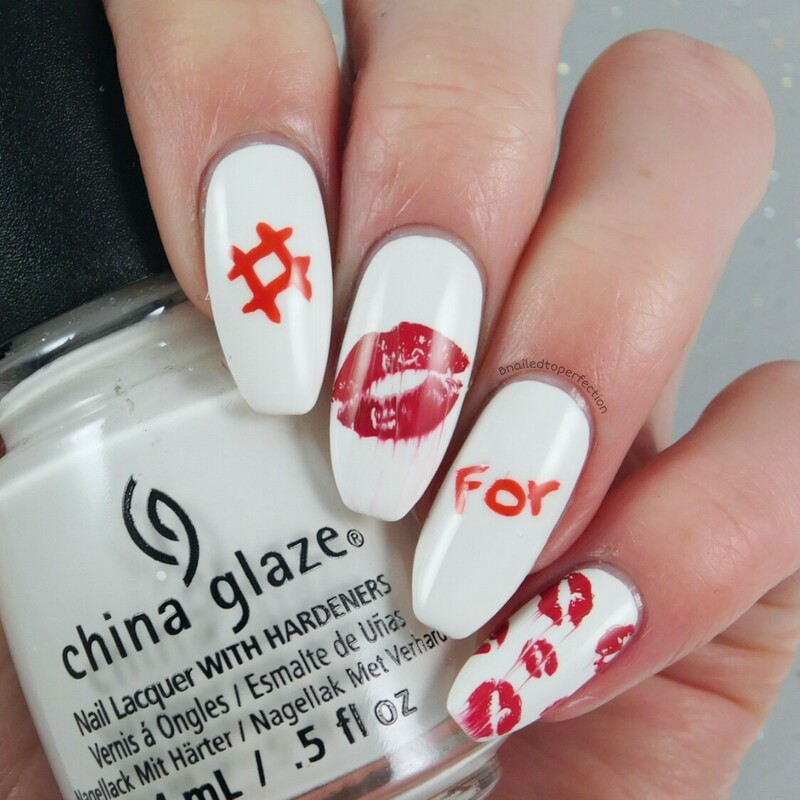 Colours are White on White from China Glaze and Dead Heat from Barry M. The red lips have been stamped with Red Dragon by Colour Alike. With my next mani I used my favourite colour, teal, which is also the colour for Cervical Cancer Awareness. I used Palace in the Moon by Moo Moo Signatures and also Thousands of Years of Fairytales over the top. Then I used White on White again and applied some teal lips using these Kisses vinyls. Here's my personal reason for wanting to take part. About 6 weeks later I got the news that my cells were grade 1, occasionally grade 2 which is good news. I will be having a second Colposcopy in June this year to ensure all the abnormal cells have gone. I wanted to share this with you all as god knows what may have developed if I didn't go for regular smears, which is every three years for a woman of my age. This was only my second smear so it just goes to show it can happen at any time. Everyday in the UK 8 women are diagnosed with cervical cancer and 3 women die. It is the most common cancer in women under 35 but yet 1 in 4 UK women do not attend their screenings. Even more shocking, 1 in 3 women aged 25 to 29 do not attend. This is a free service provided by the NHS in the UK and is estimated to save around 5,000 lives every year. So why would you not go? Yes it's a tad uncomfortable and a bit embarrassing but the nurses have seen it all before ladies! You can also donate to Jo's Cervical Cancer trust. 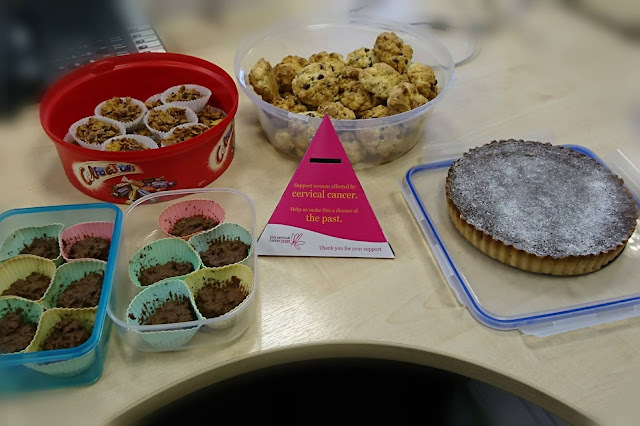 I took treats into work to sell, and a few of my colleagues helped too, and we raised £28 ,which I will be donating to the charity.